HMMWV glow plug controller and protective control box. KDS Smart Start System (S3) P/N 6500391, CR-2701. NSN 6110015427901. 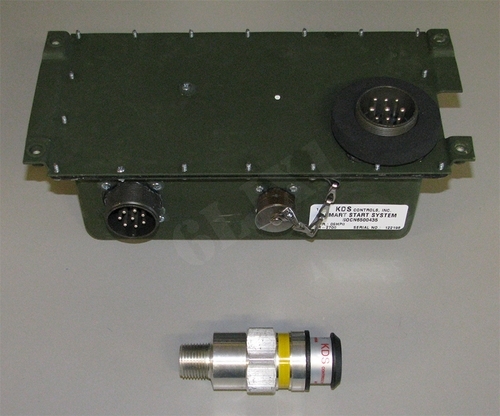 Replaces P/N 12479192, NSN 6110014912158. Made in USA This set contains the protection control box CR-2700 (6110015427668) and glow plug temp control CR-2696A (2920014696903). Factory new/unused. Control box and temp sensor are a matched set. Do not mix KDS Smart Start and earlier version Prestolite / Nartron EESS controllers or boxes on the same vehicle. The Smart Start system is compatible with all HMMWV models and does not require any modifications to install. Late model vehicles were factory equipped with this glow plug system. Disconnect batteries before installing the control box. Failure to disconnect batteries before installing or removing control box connectors will damage the control box. It is highly recommended to check the glow plugs before installing a new control box. Defective glow plugs may damage the control box. A working glow plug will draw 12 - 15 amps at 24 volts DC. Use extreme caution when testing the glow plugs as the tip will immediately become very hot on a working plug. The complete glow plug system will draw approximately 80 - 125 amps (the colder the ambient temperature the higher the initial current draw). The vehicle batteries must be in good condition for the preheat and start system to function. If the batteries cannot crank the engine they won’t operate the glow plugs. Only the 60 amp alternators can power directly through the control box. Basic and A1 vehicles upgraded to 100, 200, and 400 amp alternators must have the alternator wiring harness modification in place (done when the alternator is installed) so the alternators output does not go through the control box. Vehicles factory equipped with 100, 200, and 400 amp alternators have the battery direct wiring factory installed.